Sound engineer included in all bookings unless otherwise at your request. NoiseGate Studio, Las Vegas offers all the Recording Studio services you need — from recording and mixing, to mastering and distribution. Contact us to reserve time in our studio and start working with the very best recording professionals in the biz. We offer block-booking rates for more than 5 hours of studio session. Or $65.00+/hour. For more than 5 Days booking, call for quote as our rates varies depending of length and type of project. Create and capture your next sounds with experienced professionals and the latest recording technologies at NoiseGate Studio, Las Vegas. You’ll have your pick of equipment — everything from microphones to electronic mixing consoles. Contact us to set up a time for your Recording session today! The world of sound is at your fingertips. Looking to bring your creative concoctions to life? Book your Mixing session at NoiseGate Studio, Las Vegas and work with our experienced team to realize your unique sound. Together we’ll collaborate throughout the entire production process to develop a final recording you are proud of and which your fans will enjoy. Contact us to start Mixing today. 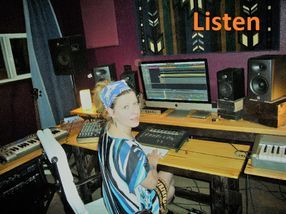 Want to record your own sounds from the comfort and convenience of a professional Recording Studio? Reserve your next Mastering session with us and get access to all of our state-of-the-art equipment and studio space. Don’t wait too long, our calendar fills up fast. The JazzyBell Project "Song for my Father"
I Shop Gad "King of the Jungle"
The JazzyBell Project "Downtown Brooklyn-Part 1"
Oneida James "Lune D' Argent"